This week amateur astronomers from across Canada are converging on the University of Victoria for an annual gathering that goes back to 1960. Called the General Assembly of the Royal Astronomical Society of Canada, this meeting moves from one locale in Canada to another each year. Last year, it took place in Thunder Bay, Ontario, and next year it is slated for Halifax, Nova Scotia. The GA has previously taken place in Victoria in 1972, 1981, 1988, and 1998. Part of the meeting is business - the Annual General Meeting of the RASC takes place there. 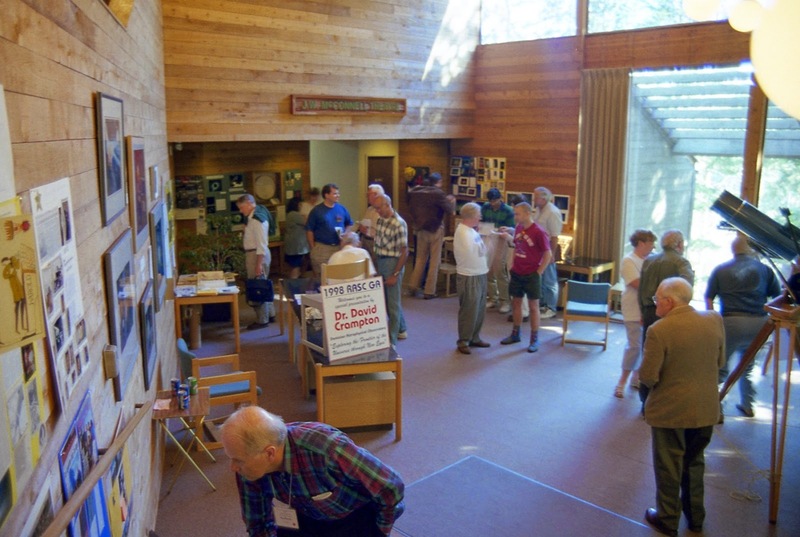 But it is also a place for great guest speakers and for papers presented by RASC members. And there is plenty of socializing going on as well. The RASC got its start as an informal grouping of astronomy enthusiasts in Toronto in 1868, and the and during the early years, it was a Toronto organization. The Society was formally incorporated in 1890 and in 1903, the society won its royal designation from King Edward VII and took on the RASC name. By then astronomy clubs in other Canadian centres began to join the RASC, and it evolved from a Toronto group into a national society that today includes astronomers in all parts of Canada. Each local club affiliated to the RASC is known as a Centre, and today there are 29 centres spread out amongst Canada's 10 provinces. About 4,200 people belong to the RASC. This year, the Victoria Centre is celebrating the 100th anniversary of its creation, although I have found that efforts to set up an astronomy club in Victoria actually began in 1907. By 1914, the Dominion Astrophysical Observatory was under construction on Little Saanich Mountain, and the presence of this world-class observatory, along with the arrival fifty years later of the University of Victoria and its physics and astronomy department, has ensured the durability of the Victoria Centre. For much of the history of the RASC, it held a formal Annual General Meeting in Toronto, but in 1960 the first GA took place in Montreal. I first joined the RASC while I was finishing grade school, and attended my first GA in Calgary in 1968. While many of the people I met there are gone, there will be two or three other participants from that meeting who I'll catch up with at this Victoria GA.
Astronomy has changed a great deal in those years, and so has the RASC. In the 1960s it was a mixture of amateur and professional astronomers, but as the ranks of professionals grew in the 1960s and 1970s, they organized their own professional association. Fortunately, many have chosen to remain with the RASC. The instruments we amateurs use today are far more powerful and sophisticated than what we had in the 1960s, which means that amateurs are playing a bigger role in formal scientific work than once was the case. And the astro photos taken by many of my friends in the RASC today can compete with almost anything else taken from Earth. The Centres provide a place for members to come together for shared astronomical activities including star parties and public outreach, such as the Saturday night observing that will take place this summer at the Dominion Astrophysical Observatory. The Society produces publications such as the annual Observer's Handbook, the Observer's Calendar, the RASC Journal and others. 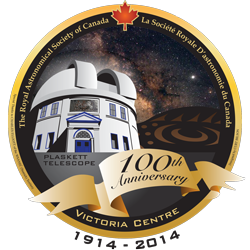 For such a large country as Canada, RASC provides a rare opportunity for Canada's amateur astronomers to congregate. With the arrival of online resources and social media, not to mention the many changes taking place in Canadian society, we in the RASC are working hard to keep up with relevant events and services. Fortunately, new technologies are making amateur astronomy more exciting and accessible. 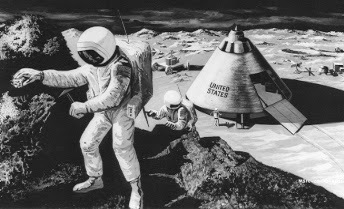 Ideas for sending humans for Mars have been around for many years, including this 1960s NASA concept. NASA Image. On December 19, 1972, the astronauts of Apollo 17 strapped themselves into their couches and rode their Command Module through a high-speed re-entry to a splashdown in the Pacific Ocean. The three astronauts were returning from a highly successful expedition to the Moon, and the end of their flight marked the last time that humans ventured beyond low Earth orbit. More than four decades have gone by since the end of Apollo, and since then supporters of human space exploration have looked to the day when humans will again strike out beyond the environs of Earth. Most people who support space exploration look to Mars as the target, a fact that was underlined early this month when the Committee on Human Spaceflight of the U.S. National Research Council (not to be confused with the National Research Council of Canada) issued a major report on directions for the U.S. human space program. The report is the latest in a long series of reports commissioned by NASA, Congress (as in this case), presidents, and advocacy groups looking into the state of space exploration since the end of Apollo. While these reports have sometimes been commissioned in the hopes of stirring action or to give the illusion of action, none has so far hastened the day when astronauts will pull away from Earth orbit. But this latest report discusses some home truths that are worth considering in relation to the current state of America's human space exploration program. First is the matter of public opinion. The report reviewed public attitudes to space exploration over the years, and found that consistently, more Americans think too much is spent on space than those who think too little is spent on space. While it is true that most people have an inflated idea of how much money is spent on space (NASA's budget is well below one percent of the budget of the U.S. government), it is hard for politicians to ignore public opinion, particularly when there are so many competing priorities for public dollars, many of them which are capable of creating great political controversy. The highly expensive Apollo flights to the Moon are popular in retrospect, but polling data from the 1960s show that the public did not enthusiastically support spending on that program. Historians (including myself) are looking into the roots of Apollo, and increasingly we are finding that the race to the Moon was more a series of coincidences that for a few years vaulted space exploration into the realm of national security, always a high priority spending item, rather than being a major milestone on humanity's inevitable march to the stars, as many people believed at the time. In a time of continued recession in the economy and austerity in U.S. government spending, the odds of NASA winning new funds for human space exploration are not great. NASA's human space exploration funds are being consumed by the International Space Station and efforts to build a replacement spacecraft for the space shuttle. The report also set Mars as the "horizon" or long-term goal for U.S. astronauts, not a surprising goal but one that involves a number of complications. While previous administrations, including both Bush administrations, had set a NASA a goal of going to Mars, the Obama administration is pursuing an asteroid capture mission that would use robot space vehicles and the new Orion spacecraft being developed by NASA. This plan is not popular in Congress, where many space advocates want more of a focus on Mars. But as the report suggests, there are a number of ways to get to Mars. It lays out three possible paths, including a Mars mission following an asteroid mission as proposed by the Obama administration, a mission to Mars following a return to the Moon, and a Mars mission following a step-by-step set of missions including the Moon and an asteroid. These suggested approaches run contrary to ideas advanced by Mars flight advocates such as Robert Zubrin, who has been urging NASA to forget the Moon and any intermediate targets, and instead focus on a mission to Mars. Two highly publicized private initiatives are taking the Mars direct approach. One, which was promoted by Denis Tito, the millionaire who in 2001 became the first private individual to buy a trip into space, has foundered on funding problems, while another involving a one-way trip to Mars, continues despite the many questions hanging over it. The report suggests that NASA continue to work with international partners, but this is problematical because U.S. government agencies are prohibited from working with China, today's rising space power, and cooperation with Russia is in jeopardy because of the crisis in Ukraine. One message I take from this latest report is that Mars remains an elusive target, not only because of its great distance and the challenges involved in getting humans to Mars and back, but mainly because of a persistent lack of public interest in paying the price for such a mission. The ham handed efforts by Stephen Harper and his Prime Minister's Office to control government information have rightly caused outrage both inside and outside Canada, particularly because often the messages that do go out are misleading and are designed purely for the benefit of Harper and the Conservative Party of Canada. As a historian, I join my colleagues in opposing the Harper government's attacks on the Library and Archives of Canada, the census conducted by Statistics Canada, and other services needed by historians to do our work. Moreover, the Harper government is working to promote an historical view of Canada that caters to the prejudices and blind spots of the Conservative 'Base,' in opposition to new directions emerging in Canadian historical research. Canadians regularly see the Harper government use every trick in the book to advance its agenda, including shutting down Parliament and abusing its rules and traditions, using taxpayers' money for partisan advertising, and shouting down or removing all sources of independent oversight and advice, including those created as part of Harper's own accountability promises made before he took office in 2006. The bottom line of these efforts is to exercise relentless control over all messages emanating from the government to suit the political needs and whims of the prime minister. This muzzling is a particularly controversial in the area of science, as explained in The War on Science by journalist and recent Green Party of Canada candidate Chris Turner. Relying heavily on the work of the shrinking group of journalists covering science in Canada and a few interviews with key scientists who were willing to talk, Turner has served up a concise critique of the Harper government's efforts to fit scientists into the straitjacket of its media messaging. The War on Science focuses on science related to the environment, where Canadian government researchers who have been examining the development of climate change have run head on into the Harperite goal of creating economic wealth through exploitation of oil and gas resources, the primary culprits in the jarring climatic changes that are already changing life on Earth. Many Canadians are already familiar with Harper government measures that have led to scientific institutes being shut down or severely cut back, notably the Experimental Lakes Area in Ontario, and that have seen those researchers who still have government jobs being forced to to run every public statement through media minders with direct connections to the Prime Minister's Office. Canadian government science is being subordinated to politics, as Turner persuasively argues. Even outside the area of environmental science, the Harper government has damaged Canada's scientific assets. The National Research Council of Canada, which has nearly a century of distinguished research behind it, is now being reduced to being a "concierge" for Canadian businesses seeking scientific help. This directive threatens the NRC's work in basic scientific research that has historically led to economic benefits, but fits in with Harper government spin that it is focused on creating jobs. In criticizing the Harper government's treatment of science, Turner does miss a number of nuances. Peer reviewed science is without a doubt superior to politics as a means of judging the quality of science, but even peer review and the scientists who carry it out are not without fault or bias. And while the Harper government has taken political control of science to a new level, this problem did not begin in 2006 when the Harper took office. As Turner discusses in his book, politics has trumped reality at the Department of Fisheries and Oceans for many years as powerful economic interests caused previous Liberal and Conservative governments to ignore or suppress the real scientific findings that our fish stocks were in danger. The result of this massive failure was the collapse of Newfoundland cod fishery in the late 1980s and more recently the fragile state of salmon fisheries on the West Coast. The Harper government has imposed massive cuts, including the destruction of libraries, on this department. The sad story of DFO isn't the only one. Another federal department (missed by Turner) with a long history of politically-driven research is Health Canada, where powerful commercial interests, including food producers and the pharmaceutical industry, have called the research tune for decades. Health Canada has long suffered from the governments putting the desire to be seen as friendly to business above the need to protect the public. And like many other countries, when Canada has been at war, its scientists were enlisted in developing new weapons and means to counter other weapons. The history of government-supported scientific research in Canada before 2006 is not as straightforward as Turner would have us believe. But it is true that the Harper government has taken political manipulation of the government's scientific work to a whole new level. And this trend is even more ominous because it is happening for reasons of pure politics to satisfy a group of people, the Conservative 'Base,' many of whom have difficulty accepting numerous realities of the twenty-first century such as climate change. There is also a whole other story, yet to be told, about how Canada's once-proud Conservatives have fallen under the sway of the Alberta oil industry and the young market-worshiping zealots who populate the Prime Minister's Office. Even more worrying is the growth of faith-based politics around Canada, the United States and elsewhere at the expense of fact-based policy. The controversial Quebec Charter of Values promulgated by that province's former separatist government, and numerous other provincial initiatives around the country have been designed to appeal to voters' fears and prejudices. Policy being driven by the Tea Party Republicans in the United States is undermining scientific research there, as well as America's position as the economic powerhouse of the world. Despite its limited scope, The War on Science contains an important message that should be considered by all thoughtful Canadians. 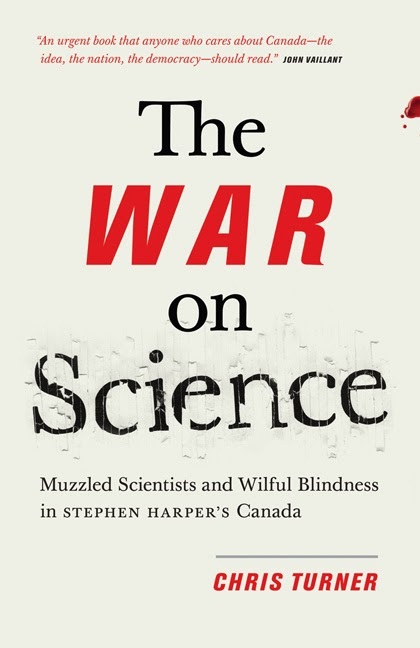 "There is a wager implicit in the Harper agenda's war on science," Turner writes. "The Conservative government is betting that meticulously message-disciplined rhetorical attacks, carefully stage-managed public pronouncements, and glossy Economic Action Plan announcements on every Hockey Night in Canada broadcast will distract the Canadian public from noticing the full toll of the evisceration of governmental science and environmental stewardship until it is too late to be undone." Turner concludes by expressing his hope that Canadians will ensure that the Harper Conservatives will lose their bet, a hope I share as the consequences of the political manipulation of Canadian science hit home.